Christmas is almost here and this means the fever period for any student. A lot of assignments that should be completed do not let them sleep. So what to do if you have no time left and you just cannot meet the deadline. In this case Wise essays will come to the rescue. The company has a wide range of writing services as they provide all kinds of essays, research papers, term papers, lab reports, statistic projects, dissertation services, admission services and editing service. 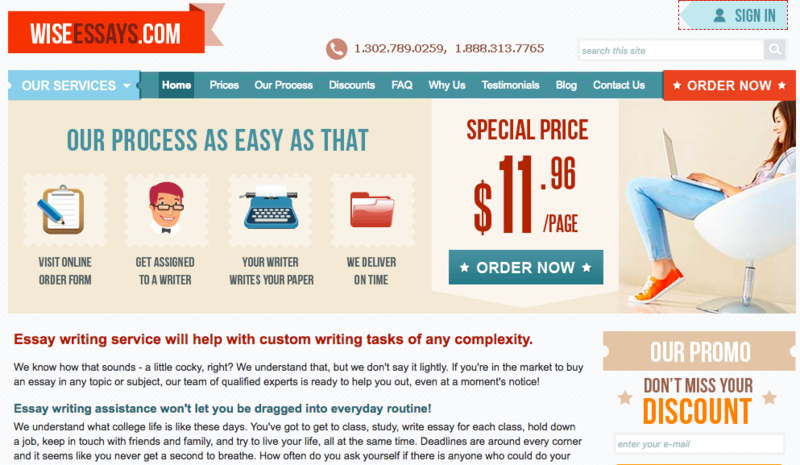 The site provides samples of their writing to assess the writing ability of the experts. The writers are well-trained and pass a strict hiring process. The writers have Master or PhD degree and specialize in some field of knowledge. They have experts in almost all fields of study and assign the corresponding writer according to the topic of your assignment. The prices vary in accordance with the academic level (high school, college, undergraduate, graduate, PhD) and the urgency starting from 6 hours to 10 days. The minimum bid is $14.95 for the lowest academic level. 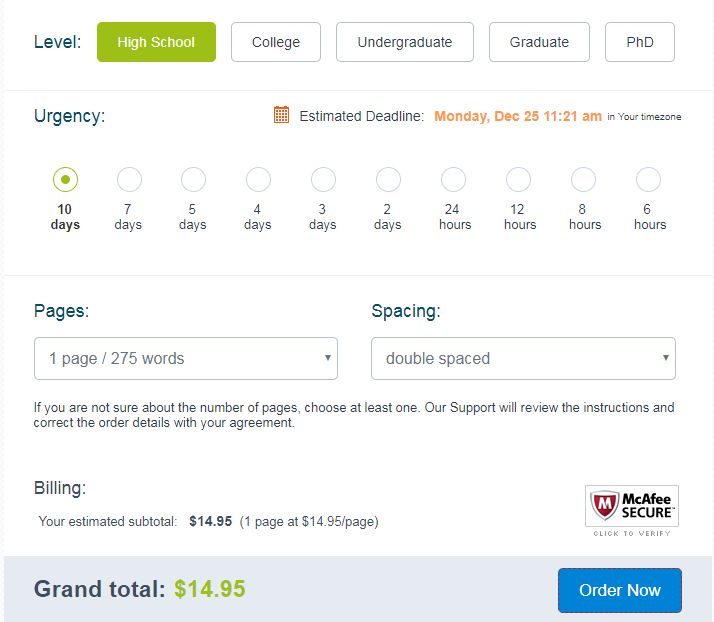 The highest price is $43.85 a page for a PhD paper maximum urgency. The company offers a lot of different discounts and promo codes. Thus, you will get 20% off for the first order and 25% discount for the second order. Besides, a customer can use special limited one-time offers as 12% discount for the paper. Wiseessays also provides lifelong discounts of 5%, 10%, 15% for 20-49 pages, 50-99 pages and 100 and more pages respectfully. Moreover, the website supplies volume discounts for all products (admission, application essay and multiple choice question are not included as they have another flexible discount policy). 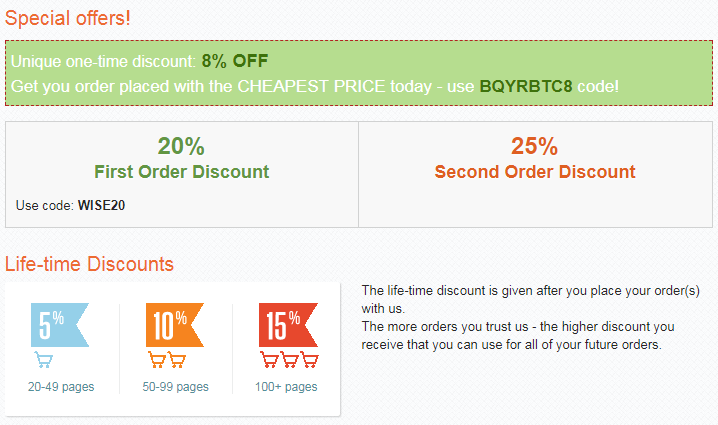 Thus, a user can have 5% off for 10-24 pages, 10% for 25-49 pages and 15% for more than 50 pages. Wiseessays.com has a number of extras as PPT slide for $10.4, Excel sheet for $16.95, speaker note for $14.95, special service package to avoid queues in chat and phone calls for additional $4.99 fee, you can set a preferred writer for additional 20% of your calculated subtotal, top 10 writers of highly qualified experts for additional $6 fee per page, 1-page summary or an outline for only additional 1 page fee, lifetime file storage for $4.99 and plagiarism report for additional $9.99 fee for up to 3850 words. They accept Visa, PayPal, Maestro, MasterCard, American Express, etc. The main concern of students is Wise essays reliable? The company has been delivering its services for 7 years already and gained good reputation with its customers. Wiseessays com reviews are the best proof of that. The company does not share personal data they collected to any third party. They keep the data protected and do not store the payment details. They also guarantee money back under the terms and conditions of the company. If you are not satisfied with the paper completed you are eligible for 14 days free revision within original requirements. The website provides round-the-clock support via phone, live chat and support email. You can follow Wiseessays on Facebook, Twitter, Feed Burner and Google+. The support representatives provide clear and quick answers for the questions. There is no queue and you do not have to wait long for respond. However, the email support is not that fast responding as live chat and phone calls. The site is user-friendly and have all important sections on the top of the site. The order button is easy to find and the ordering form is clear and simple. Five steps will guide you to your assignment request as order quote, contact info, order details, payment and confirmation. All you need is to fill in the necessary fields, only relevant information is needed. The process will take several minutes to proceed. No lateness was reported according to Wise essay reviews. However, they were cases when the writers did not meet the client’s’ instructions. Yet, these precedents are rare and almost 99% customers are satisfied with their papers and got excellent and good grades for their writings.